Lee's Deli is as ubiquitous in San Francisco as Starbucks, or at least it seems that way. What started as one local downtown sandwich shop has grown into 13 Bay Area locations serving up sandwiches made to order and a hot/salad bar for both breakfast and lunch. I do find myself in there before work loading up on bacon, just because I can and it's slightly cheaper, easier and less messy than buying and cooking it myself. 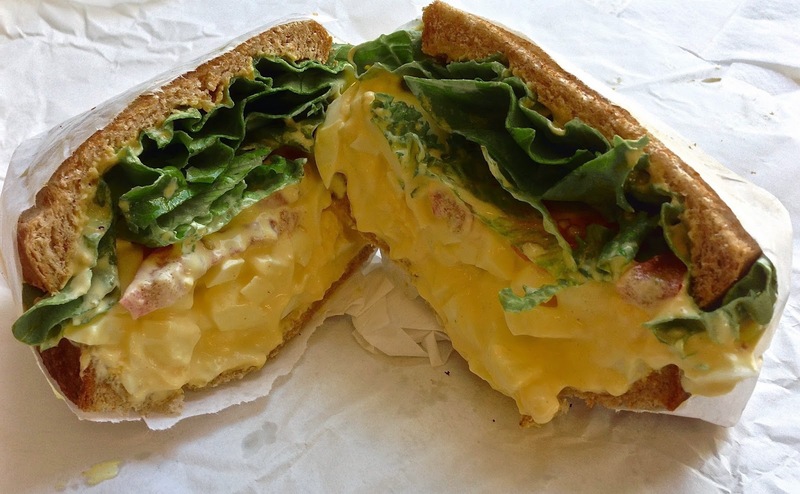 One of my go to sandwich faves here is the egg salad. I'm also calling it the messiest sandwich in San Francisco. The egg part is pretty basic--lots of eggs mashed up with what is either a hint of mayo or water--I'm still not sure and the ladies behind the counter aren't very forthcoming. Still, even with it's mysterious creaminess, I get it anyway--I like taking chances that way. They also don't skimp on the portion, it is piled on beyond the edges of the bread making it more than a handful to eat. Here you can get unlimited toppings and seeing as how the egg salad itself doesn't have much beyond egg, I add on lettuce, tomato, purple onion, sprouts, pickles, mustard and mayo on two slices of toasted 9 grain. Sprinkle on a little pepper and for $3.75 plus tax it is a sandwich that hits all the vegetable, grains and proteins needed for a filling lunch--something I do have every now and then. All of these things lead to a big 'ol mouthful that I end up using a fork to get through as the egg and toppings usually fall out all over the wrap. It's like egg salad plus a veggie salad on a sandwich. Sometimes I'll go whole hog, literally, and have them add bacon, something that may not be that unusual as the ladies don't even think twice before doing it. I'll also give them props for not skimping on anything you decide to get on your sandwich. You don't have to get egg salad when go as they have multiple other options to choose from, and considering most all of their choices run under $5 they are a refreshing option to the $8-$10 "artisan" ones that are rife in this town. If you want a good sandwich that isn't going to break your lunch budge Lee's is a good place to get a piled high bite made the way you want at an affordable price--a rarity sometimes in San Francisco. It's Cala-- a new Mexican restaurant (because we don't have enough in town already) on Fell. Tacorgasmica has finally come. Of course, it's in the Castro. b. patisserie is expanding into the sandwich game. Let's just hope some are under $10, you know I have a thing about that. It's an affogato bar in SOMA. That's like an ice cream coffee thing. I'm sure someone will be into it. Matcha! Matcha! Matcha! That's my Jan Brady impersonation with tea! Supposedly it's the new food hottie, though you can get it at Starbucks so it's both trendy and over at the same time. Blaze Pizza,where you design your own pie (like a Chipotle with pizza) is now open. But you have to go to Stonestown to try it, so there's that. Here's something about Cameroonian food and fast food veggie place in....Oakland? Chipotle's new non-GMO stance gets an NPR take down. Wait?! Del Monte was based in San Francisco? Who knew?